All bundled up and dinking into town on one of our few days we had good enough weather to do so. The dinhgy dock cost $6 a for a day pass, but if you buy a week pass it was only $28. Three times we bought a week pass, thinking, sure we will go in at least 5 times a week, but we never had more than 4 acceptable weather days in a week. We finally wised up and just bought day passes. December 22 – February 15. I know everyone has experienced bad weather this winter, snow, ice, traffic gridlock, shortages of bread and milk (and in Cabbagetown, probably a shortage of beer and wine at Littles). And I know some of you live in Canada and think we are all whiners. 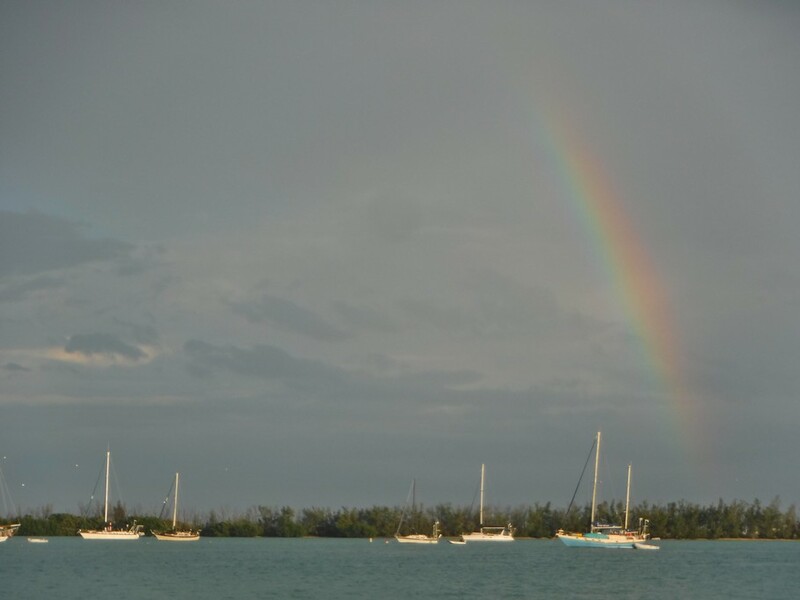 But although while we were in Key West we did not experience snow or ice, and always had plenty of bread (we make our own), milk, and especially beer, trust me, weather literally rocks our world. I mean, really, literally. Earlier this winter I was telling a Canadian friend on Facebook about how I take my long underwear everywhere. She commented that surely I wasn’t taking them to Mexico. Yes, I replied, I am. I have a irrational fear of the cold. And that fear ended up not being so irrational in Key West. During the coldest part of our stay there I was wearing those long johns, along with a long sleeve t-shirt, sweat shirt, wool socks, and gloves to bed underneath 3 layers of blankets. Eventually it got so cold I started wearing my ski hat, too. See, I thought I was going to Mexico and had shaved one side of my head and the bald side was really cold. Greg doesnâ€™t have an irrational fear of the cold and did not bring his long underwear. He was a little colder than me at night. Me and my shaved head before it got too cold. Not only was it so cold that I wore every piece of warm clothing I had aboard to sleep in, it was too cold to get naked. This meant, of course, no bathing. 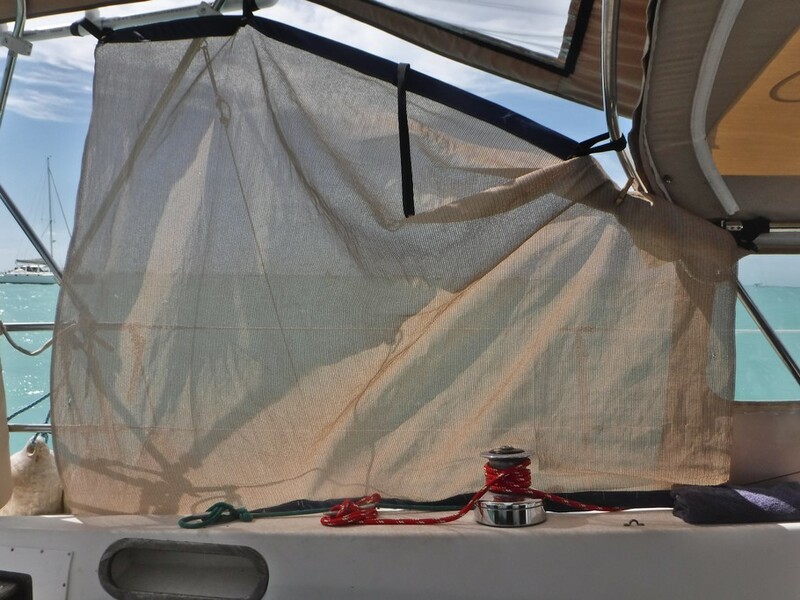 Fortunately, Florida weather is a little bipolar and every once a while it would warm up enough to have a cockpit shower, utilizing the two screens I had sewn as sun shades (that ended up being used as wind blocks) on either side of the the boat. 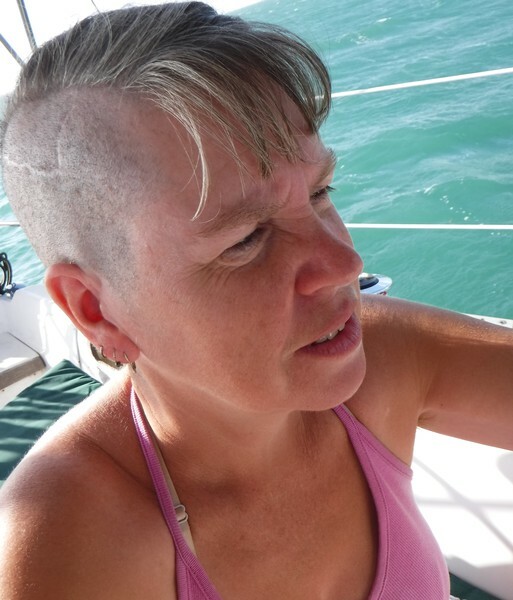 We were having showers so infrequently, though, I thought I would never get my hair clean and would have to shave the rest off and start over. The sun shade I sewed that ended up being used more as a wind breaker. 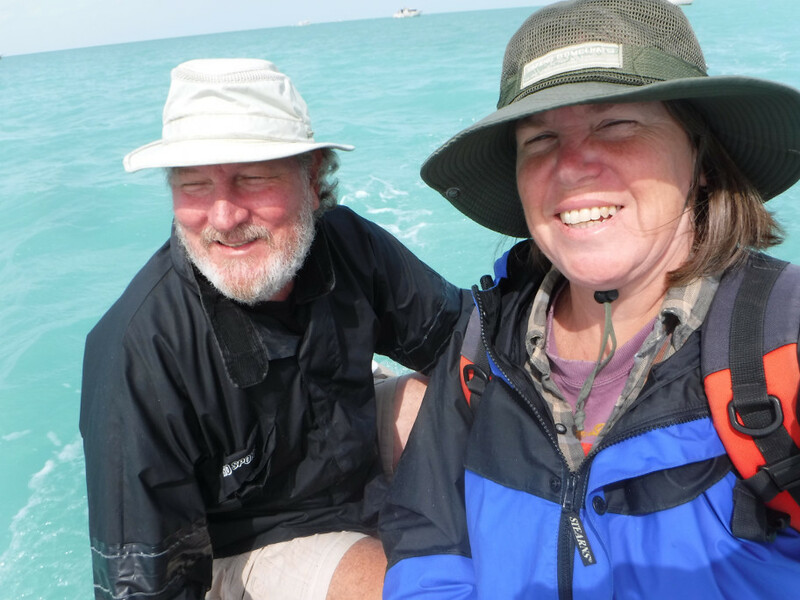 Out of the 56 days we were in Key West, we only went to shore 16 times. Granted a week of that time we didn’t leave the boat because of Greg’s injury. And of course that was the prettiest week we saw. But even subtracting those days we were still on the boat two thirds of the time. Why? Rain and cold fronts. During a front the wind which usually blows a reasonable speed from some point in the east, swings around and blows from south, west, then north, picking up considerable strength, some times bringing rain and even colder temperatures with it. 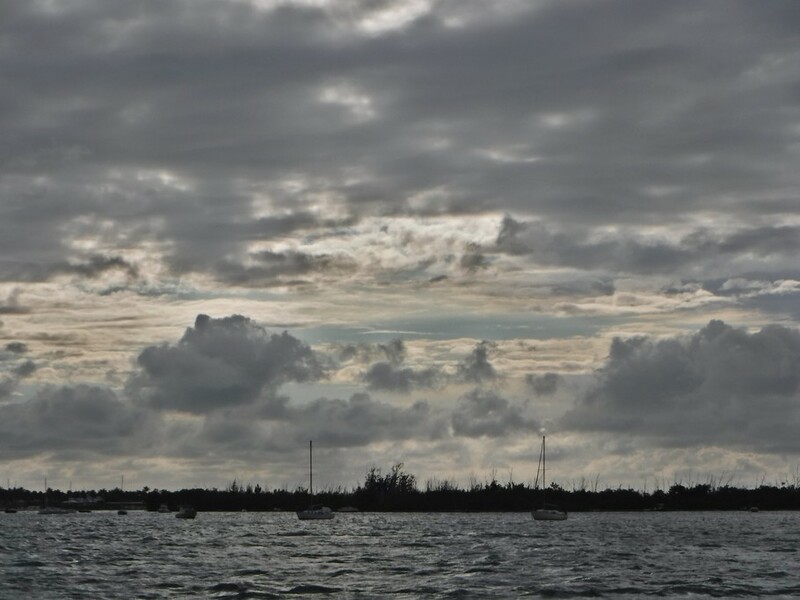 When we were in the Bahamas and we knew a front was coming we would head for shelter somewhere where we would be in the lee of the wind (having land between us and the wind) on all sides. This would happen maybe once a week. 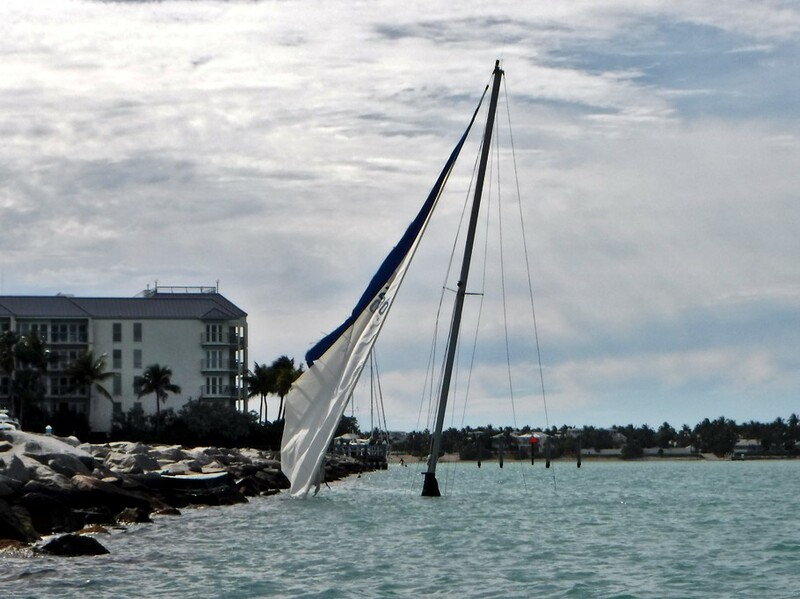 In Key West there is no where to hide from the wind in all directions. In our little spot out in the anchorage we had good protection from the east and south, basically nothing from the west and only the Florida Pan Handle from the north. And unlike our prior experience in the Bahamas, we were getting a front almost every other day for a while. A boat being towed during a storm. Now the wind is great. 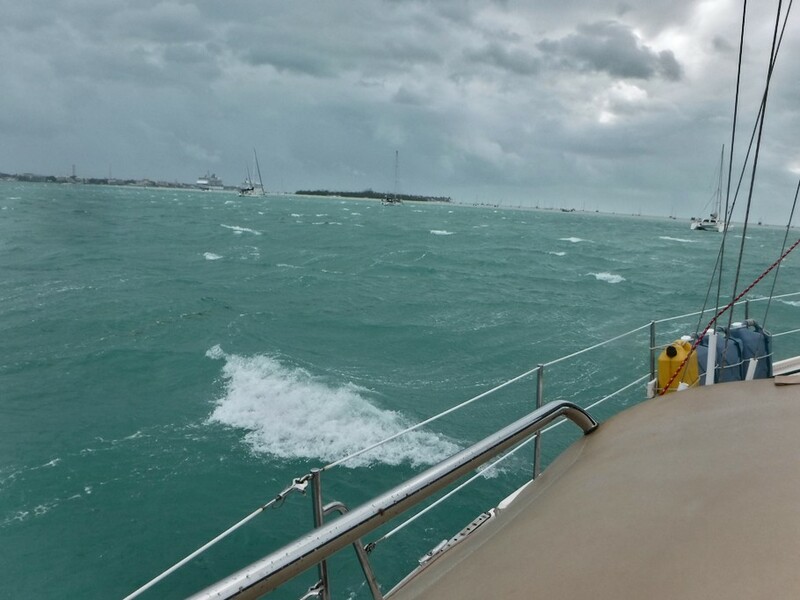 The wind can be a sailors friend, it propels our boat and keeps us cool in the tropics. The sound it makes as it quietly moans through the rigging can be beautiful to hear and reassuring. When it raises its voice a little and howls, it is at the same time disconcerting, but also thrilling. But when it screams, it is terrifying. I had never heard the wind scream before, but one morning we woke up to just that. It was scary. The boat was rocking and waves were splashing on deck. 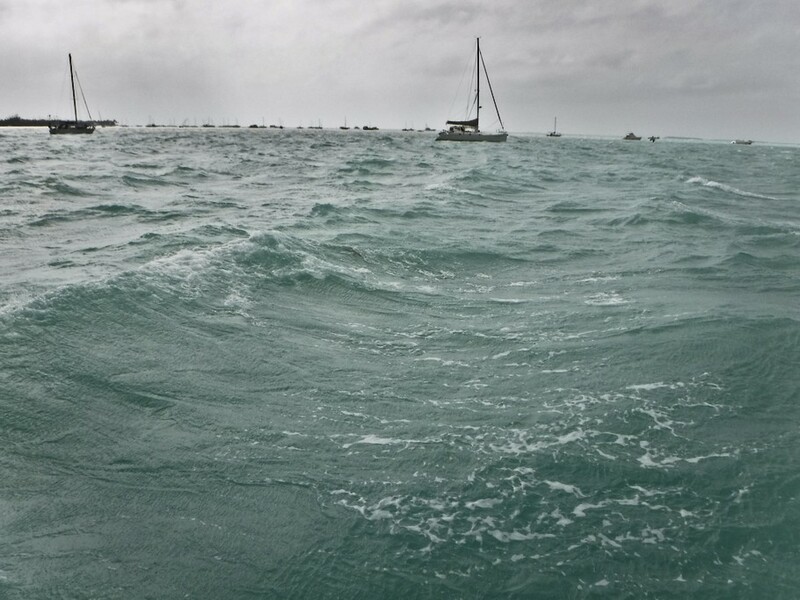 Waves splashing on deck when you are at anchor is completely wrong and scary. I looked out a window and saw five foot waves rolling past. That was completely wrong and scary. Now usually when we get weather I like to go on deck to take pictures. You know me, I figure I will be taking pictures some day when we are drowning, thinking we might survive and write a blog post about it. But I was a little too scared that morning to do anything but hold on. I did manage, as my usual habit on front mornings, to look out the slats in our companionway hatch* to check on a couple of things in the world outside our pitching and heaving capsule. First, whether we were where we were supposed to be (in other words, had we dragged anchor). And if we were dragging anchor were there any obstacles (like other boats) that could make the situation worse. All was good on that â€œfront.â€ Next I checked whether the dinks were where they were supposed to be. From inside the boat, Fever and Jethrine are hard to see, but as a wave would roll past and Blue Wingâ€™s stern would dip down, they flew up riding the tail end of the wave, still tethered to the boat. Check, we were all still there. White caps in the anchorage. This is totally wrong. But one of the worse things about our failed season besides the weather was how good I felt. No sea sickness. Not even when the boat bounced and pitched and heaved all day. 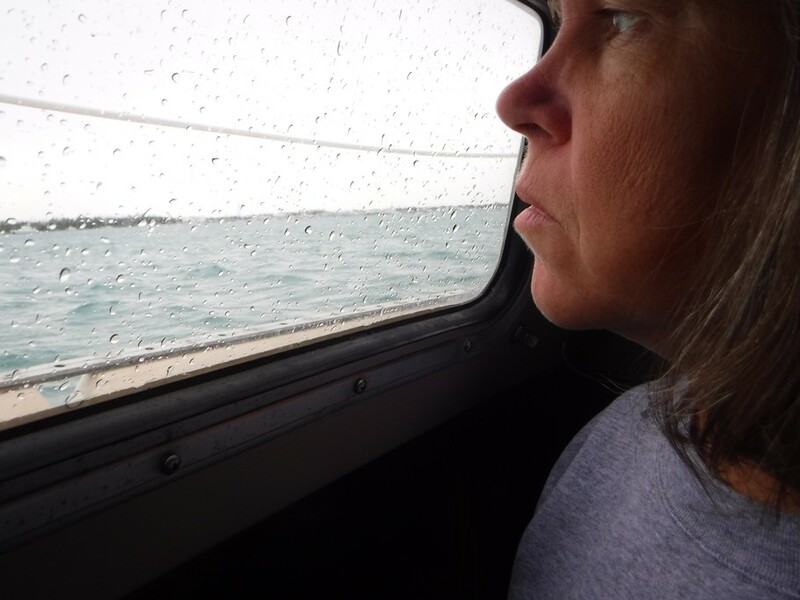 I know no sea sickness sounds like a good thing, but all of this feeling good was completely wasted on being uncomfortable, confined, and sometimes scared. 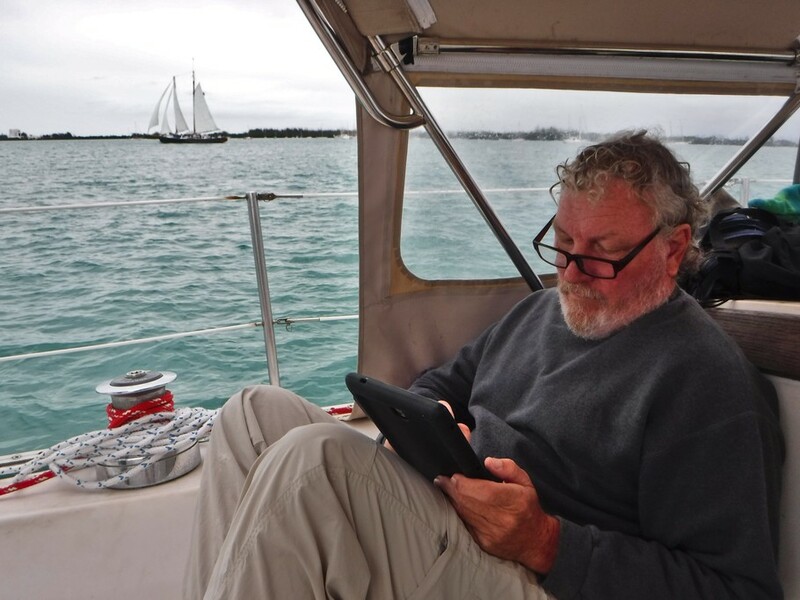 Of course, on the other hand, if I had been sick, this sailing life may have come to an abrupt end. Now, I am not trying to whine. We choose to live out here and we know we are going to experience bad weather in a more intimate way than most other people do. We are still living the life. I just didnâ€™t think living the life was going to involve wearing long underwear. * Yes, unlike prior cruising years our companionway and hatches were sealed up to keep the cold wind outside. It is so hard to capture what waves look like with a camera. The sun trying to break through grey skies. Lots of crossword puzzles got completed during our stay in Key West. In the background you see one of the big touring schooners. 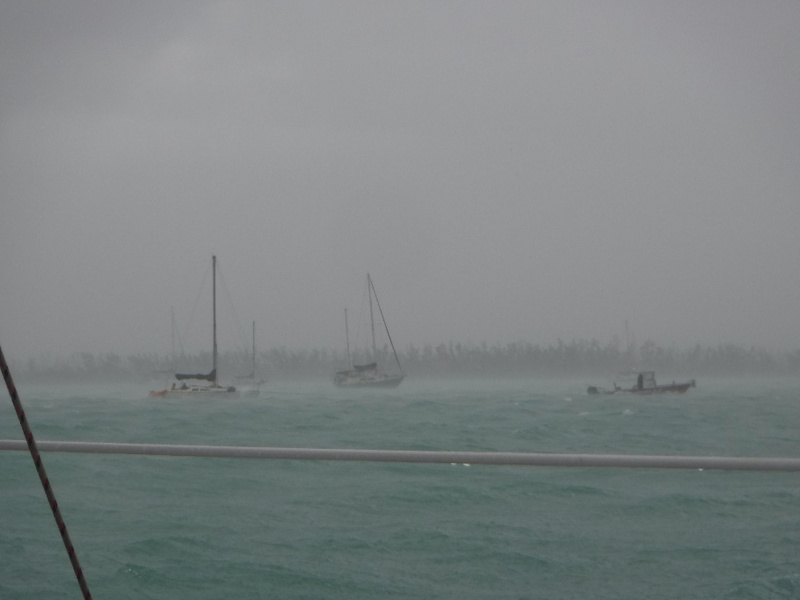 Even though they still sailed most days, we know their tickets sales must have been suffering due to the weather. Bored days taking selfies of my self looking sad at the rain outside. After days of being closed up in the boat, yea, here comes the sun! On a day after bad weather the dinghy dock which was always full, would become crazy full. 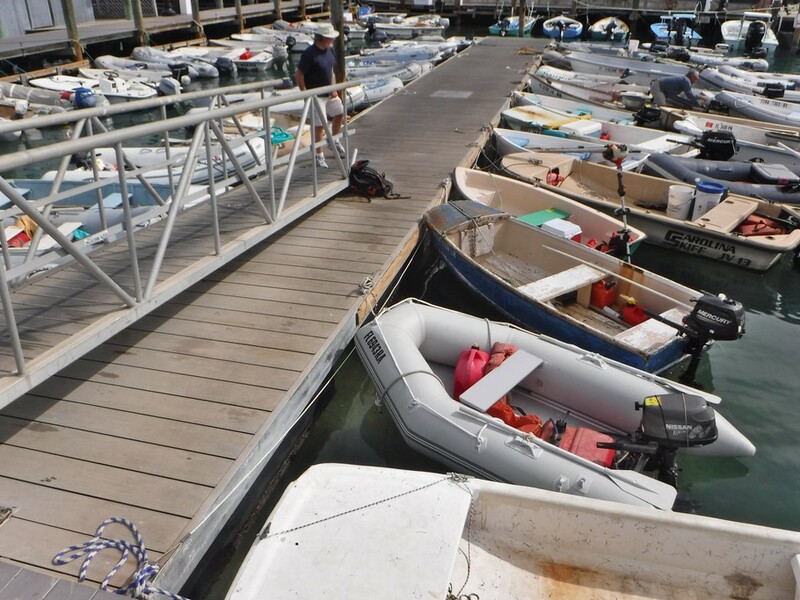 Two deep, some people had to crawl over other dinghies to reach the dock. Sail boat wrecked against the rocks. Luckily no one was living on this boat. Unfortunately a handful other boats suffered a similar fate during the many fronts. 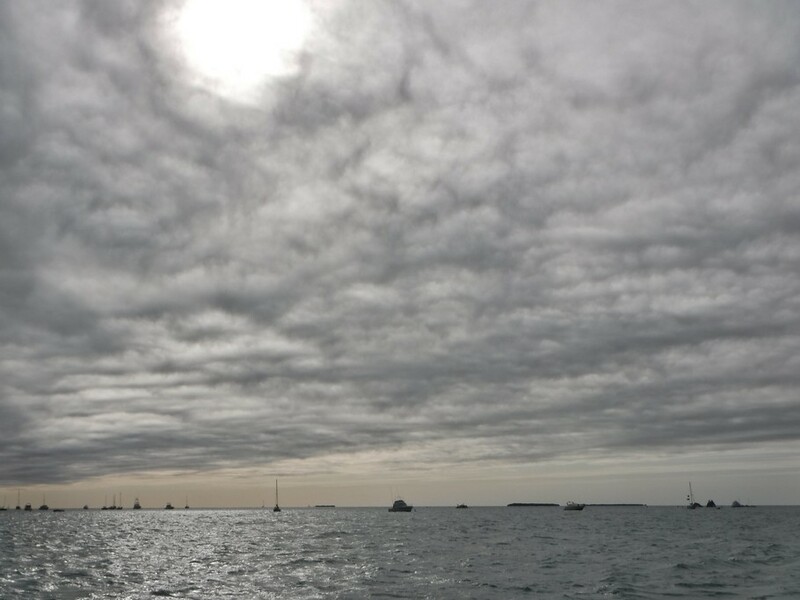 This entry was posted in Florida on the Water, Life on the Water and tagged Cold Front, grey skys, Key West, weather. Bookmark the permalink. Weather has already improved here where we are in Fort Myers. Hope to see you soon, too!